5. It’s a great way to see and learn about the latest safety products on the market. 4. The conference is one of the largest safety and wellness events in the Midwest. 3. You won’t have to travel out of Nebraska to hear some of the top speakers in the country. 1. You can enter to win Southwest Airline tickets and a free Marriott Resort gift card! Will you be joining us at the conference next week? Tell us @GreatPlainsSHO. Have you registered for the 2018 Safety and Wellness Conference? Join us in Kearney, NE September 27th for more than two dozen learning opportunities with 12 of the most well-known industry speakers. The 16th Annual Safety & Wellness Conference Registration is still open for our 2018 conference. Register now before it’s too late. 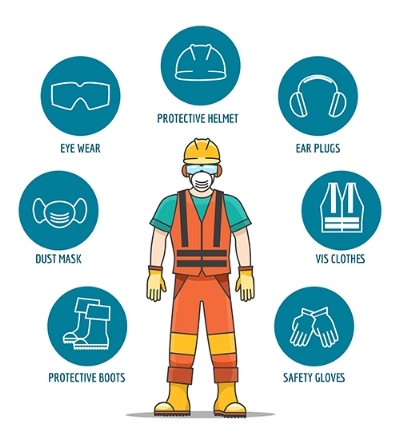 What do you need to know about PPE? PPE program that addresses the hazards present in your workplace monitors the PPE’s effectiveness. What kind of PPE do you use on the job? Tell us @GreatPlainsSHO. If you need help selecting the perfect PPE or training your team, get in touch. We have programs designed for a wide range of industries covering a wide range of topics that keep you and your team safe. Have you registered for the 2018 Safety and Wellness Conference? Join us in Kearney, NE September 27th for more than two dozen learning opportunities with 12 of the most well-known industry speakers. The 16th Annual Safety & Wellness Conference Registration is open for our 2018 conference. Don't miss your chance to get the early bird discount. Become a member of the Great Plains Safety and Health Organization and receive a free new member audit and a plan for protecting your most valuable resource – your workforce. As a part of your membership you'll receive monthly safety posters, our weekly Safety Speaks print outs and timely safety updates via email to promote safety with your team. Other benefits include: discounts on safety activities (including this years' conference!) cost-effective, customized training and other important information. day (see the chart below for more information). However, you will need more if you are out in the heat or exercising frequently, so drink up! Tweet us @GreatPlainsSHO and let us know how you like to stay hydrated? Become a member of the Great Plains Safety and Health Organization and receive a free new member audit and a plan for protecting your most valuable resource – your workforce. As a part of your membership you'll receive monthly safety posters, our weekly Safety Speaks print outs and timely safety updates via email to promote safety with your team. Other benefits include: discounts on safety activities (including this years' conference! )cost-effective, customized training and other important information. Let this year's Safety & Wellness Conference speakers be your guide. A safety professional, entertaining speaker and the leading expert on making safety fun. A motivational humorist focused on helping organizations manage change and create more positive work environments. A funny, motivational keynote speaker, change resilience strategist, team engagement and accountability expert. What's Hot in June? Safety! Don't daydream into danger. Stay focused with National Safety Month. What kinds of dangers and risks should I be aware of in hotter weather? What other types of summer hazards should I prepare for and prevent? With the pre-excitement and post-exhaustion of summer vacations, it's important to keep your focus as you are working. Remember your mind-on-task safety and take frequent breaks to rest and clear your head. Each year on April 28 we observe Workers’ Memorial Day. But do you know its origin and true purpose? Here are five things you should know about why we stand in solidarity and remembrance of those lost due to unsafe work conditions and why we fight for continuous improvements in the health and safety of our workplaces. When the Occupational Safety and Health Act of 1970 was signed into law by President Nixon, it became the responsibility of employers to ensure they provide a safe and healthful environment for their workers. To help promote and enforce workplace safety, the American Federation of Labor and Congress of Industrial Organizations (AFL-CIO) declared April 28, 1970 as the first annual Workers' Memorial Day. The Occupational Safety and Health Administration (OSHA), which focuses on health and safety for America's workforce, was established by Congress one year later on April 28,1971. In addition to OSHA, which is part of the United States' Department of Labor, the National Institute of Occupational Safety and Health (NIOSH) and the independent Occupational Safety and Health Review Commission were formed. International Workers' Memorial Day is observed by the International Labour Organization (ILO) and the International Trade Union Confederation (ITUC) and is recognized as a national day in many countries. Since 1970 the U.S. workforce has doubled with more than 130 million workers at approximately 7.2 million work sites. Yet, the standards, regulations and guidelines in place have dropped fatality and injury rates nearly 60 percent. Approximately one person dies every 10 minutes from hazardous working conditions. Nearly 3.7 million work injuries were reported in 2015, but it's suspected that up to 11.1 million actually occurred. North Dakota and Wyoming saw the highest fatality rates in 2015, each with nearly double the deaths of next highest state. Take Action. Speak Out. Join the Movement. Events are held worldwide every year to honor individuals and families affected by preventable work-related accidents. Visit osha.gov/workersmemorialday/ or actionnetwork.org/event_campaigns/workers-memorial-day-2018 to search for a Workers' Memorial Day gathering near you. I want to work safer!